A couple of weeks ago, I made an announcement. And as promised, the Running Club Roundup blog series has officially begun! I am so excited to share my experience with the Philly Runners, a group I have known about for years but have never had the opportunity to join. So let me tell you all about them! This post is my inaugural Running Club Roundup, a new blog series that takes place on the first and third Thursday of each month! The purpose of the Running Club Roundup is to share my experience of trying a different/new running club each week! I will be sharing the good, the bad, and the ugly and introducing you to different types of running groups that may fit your running style. Since I live in Philadelphia, I will be covering the 40+ running clubs in the Greater Philadelphia Area, in addition to any other running club I can get my hands on across the country! I hope that this series will not only help me connect with more runners in my community and become a stronger runner but help you break out and explore the running clubs in your area! As I reviewed my running schedule for the week, I saw that I had a couple of easy runs and a speed run to tackle before the Tough Mudder on Sunday. According to my Running Club Roundup list, the Philly Runners have group runs on Tuesdays at 6:30 pm, so that works out perfectly! The Philly Runners are one of the most well-known running clubs in Philadelphia. Formed in March 2002, Philly Runners are regularly seen participating in and supporting just about all of the local races. This group is open to runners of all skill levels, from beginner to elite athlete and everything in between. The group is free to join and meets year-round, rain or shine! 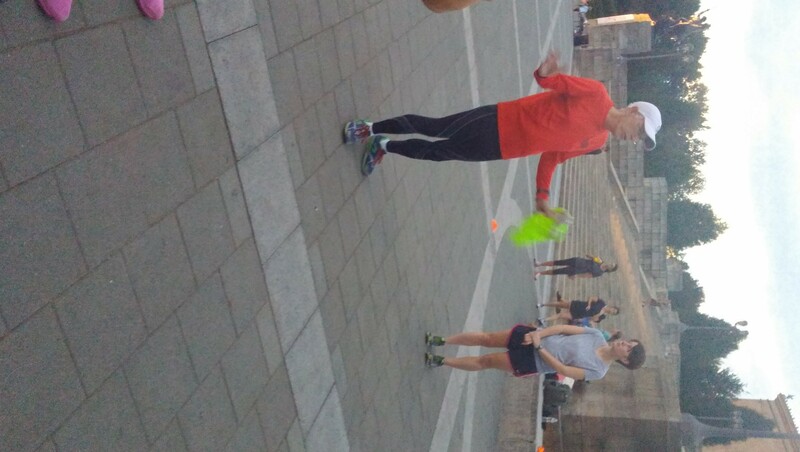 I arrived at the famed Art Museum (aka Rocky) steps a little after 6:30 and saw a group of about 15-20 runners gathered. There was a second group of runners congregated nearby so I was a bit unsure of what was going on – were the pace groups already set up? I asked if they were the Philly Runners and I was in the right place. Apparently the other pack of runners was a different group (that I’ll have to try out later!). Seth, one of the leaders of Philly Runners, introduced himself and asked about my running plans for the night which was 4 miles, 11-minute pace. He said that I’d probably have no one to run that pace with me, and my heart immediately sank. He did say that it shouldn’t keep me from coming. Meanwhile, it was time to get started and Rick (pictured above), another leader, gave some general introductions about the group, made announcements about upcoming volunteer events, and cautioned about running at night and sharing the trail with (dreaded) cyclists. Then the pace groups were called: “Sub-7-minute pace, 7-7:30 pace…” No one was slower than a 9:30 pace. Wonderful. Again, my heart sank and I set off on my solo “group run”. Fortunately, Rick agreed to run with me for a little bit, even though he just completed the Steamtown Marathon a few days prior. For our brief time together, I really enjoyed learning about him (he’s completed 34 marathons) and simply chit-chatting. Once he stopped to walk, I was on my own. And it was tough. I started to question if this running club roundup was just a silly idea. I already feel insecure about my slower pace, and this just made me feel more aware of it (once upon a time I was a solid 10-minute runner…feels like a lifetime ago). Since it was dark, I couldn’t tell who on the trail was from Philly Runners, but everyone seemed to be flying past me in both directions. As I was getting to the halfway point, I saw Seth with some others and he waved to me…I was too upset to acknowledge it, but I really do appreciate it now. Then when I finally made it back to the starting point and everyone was congregated around the steps waiting, Seth gave me a high-five. In my negative, insecure state I actually imagined being welcomed with a condescending applause from the group for being the last person to come back. Man did I beat myself up on that run…I was in a really dark place! Once everyone is finished with their run, every Tuesday night, the group heads over to The Bishop’s Collar for dinner and drinks and essentially takes over the bar. I was still feeling a bit down post-run, but I wanted to have the full experience with the Philly Runners. I chatted with Seth and his friend Brian on the way to the bar. I really felt at ease and told them about my mission to run with all the running clubs in Philly. It was cool to hear about “back in the day” when there were no running clubs in Philly. I had a delicious Fordham Brewing Company Spiced Harvest Ale and a roast beef sandwich (with salad!) for dinner. I evolved from meekly joining the group at the table to talking and laughing about baseball, politics, and running (of course). I’m never so chatty with a group of people I don’t know! I talked to runners who are training for the Rock and Roll Philly Half, the Philadelphia Half Marathon, and heard a guy talking about running a marathon in Tokyo. What started out as a scary experience ended up with me heading home with a smile on my face. Maybe this Running Club journey won’t be so bad after all! If you are a speedier runner who likes to work hard and play hard, the Philly Runners is a great group for you to join for a run! They are very organized with group leaders that are friendly and easy to talk to. Because of my average run pace of 11 minutes, I’d never be able to keep up with this group on Tuesday nights. I was pretty lonely on my evening run; I don’t want to run solo when I’m with a running group! I need to find a running group where I’m not running alone. But I really enjoyed talking to the members of the club after the run. The group is friendly and diverse and I love how running brings us all together. In short, I’ll check out Philly Runners again, but only when I’m doing speed work! 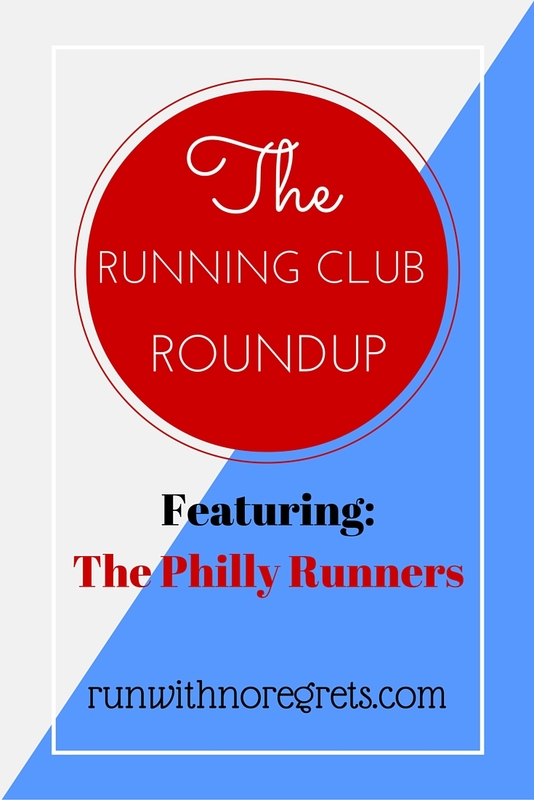 So that’s that, my first running club roundup with the Philly Runners – I really hope you enjoyed it! Stay tuned to see who I run with next! Have you ever been the “slow one” in a running group? How did you get through it?